Did anyone wonder what this was on the lampost near the exit of Meadowbank / Kaimes / Hillhouse Wynd, to the east of the village? A few weeks later a team of six volunteers met with Councillor Carl John, Road Safety & Traffic Management Senior Engineer Andy McMahon, Alistair Shepherd from Lothian and Borders Police and myself to discuss a particular area of concern to the East of the village. This area has had three capital assessment requests in the past (unfortunately dates are unknown when) and has been the location of a traffic incident. One of the volunteers also reported their husband had broken their ankle after falling from the pavement and had to be protected by two cars due to speeding traffic prior to the arrival of an ambulance. This incident had not been reported to West Lothian Council until the meeting. The concern for this area of the village is the speed at which traffic and buses are travelling on this straight stretch of road leaving and entering the village and the thin width of the pavement at this area. The group of people wanted to see what options there could be for speed calming measures from here to the main street of the village and wish put a proposal to the council for budget consideration from January for the new financial year in April. At the site visit it was evident a number of cars were travelling at the correct speed of 30mph but a number of cars were speeding and slowing down, particularly as one of our party was wearing a yellow safety jacket. During this visit Andy McMahon recommended approximately 5 full road width speed bumps at 100 yard intervals as the likely solution from the entrance of the village leading to the centre of the village (roughly to the garage entrance). This would cost approximately £40,000. 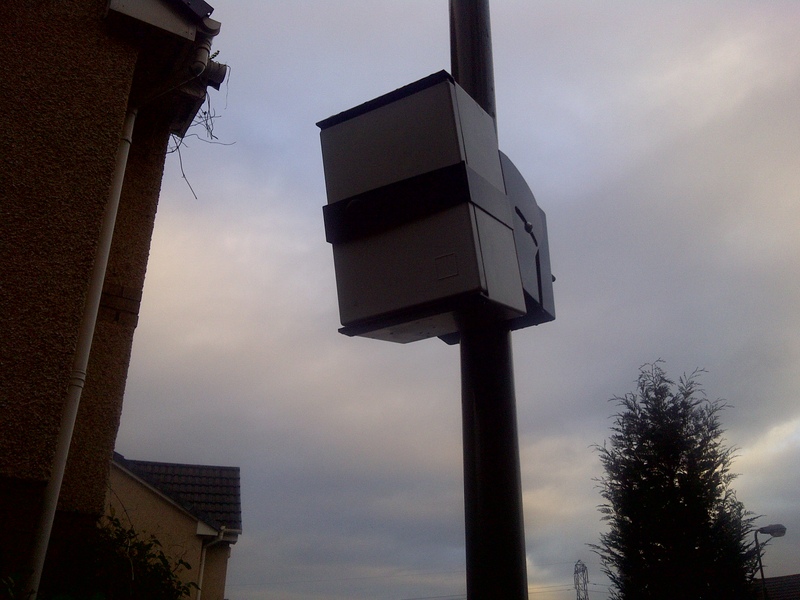 Alistair Shepherd offered to put up a new piece of equipment from the police that measures number of cars and speed. He expected that to be operational by the end of Noveber but we were lucky to get it installed far earlier than that. The group decided to monitor cars leaving the village on the pavement side (as this was more of concern) although it is expected that cars coming into the village would be travelling even faster. The equipment was up for one week and the results are expected soon. This will help determine how dangerous the area is (although it is recognised the pavement, no matter at what speed the traffic is, is a danger spot). In the meantime the residents of Kirknewton who volunteered to take this issue forward request you think about your speed at this area – already we have seen one accident, an injury, hands being brushed by traffic while standing on the pavement and the death and injury of a number of household pets. Other issues that came out of the community consultation traffic management recommendations and comments made at the meeting and by a number of people in the past were reported back to me by Andy McMahon after the meeting and I thought they would make interesting reading for you. “The parking issues outlined in your report at Kaimes Crescent and Main Street. In response to the double parking issue raised in Kaimes Crescent. Any instances of obstructive parking caused by double parking should be reported to the police for any necessary enforcement. In reference to the parking issues raised on Main Street. This issue has been looked at previously and proposals were forwarded to the community council, however no agreement could be made regarding the extent of the proposed restrictions. As stated at the meeting, the parking will slow vehicle speeds along the Main Street, however if there are any specific pinch points or problem areasidentified, these can be investigated further. In response to the parking issue outside the school detailed on the plan within your report. The council works with all schools in West Lothian to promote various initiatives, in an attempt to reducethe numbers of children being driven to school. These include walking, buses, parksmart, cycle training etc. This work is ongoing and is proposed to continue. The request for traffic calming on Main Street from Hillhouse Wynd to Forth View discussed at the meeting and your request for traffic calming on Station Road detailed within your report. The council receives many requests for traffic calming and similar other works throughout West Lothian. Unfortunately the funding available to implement schemes is limited and therefore has to be prioritised. 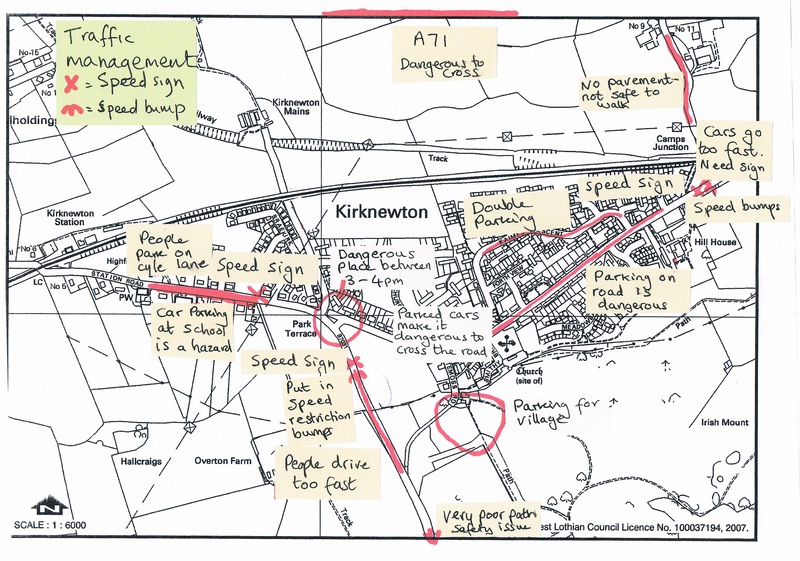 Requests for traffic calming have been prioritised based upon the injury accident rate (it should be noted in subsequent information from Andy that dates of requests for traffic calming from residents of Kirknewton do not seem to have been recorded) . The available funding for traffic calming and other such works is fully committed with prioritised schemes currently being implemented. Unfortunately there is no further funding available for traffic calming and similar works at this time. However, I can confirm that a request for traffic calming on Main Street, Kirknewton is on our request list and a request for traffic calming on Station Road will be added to our list, to be assessed should funding become available. 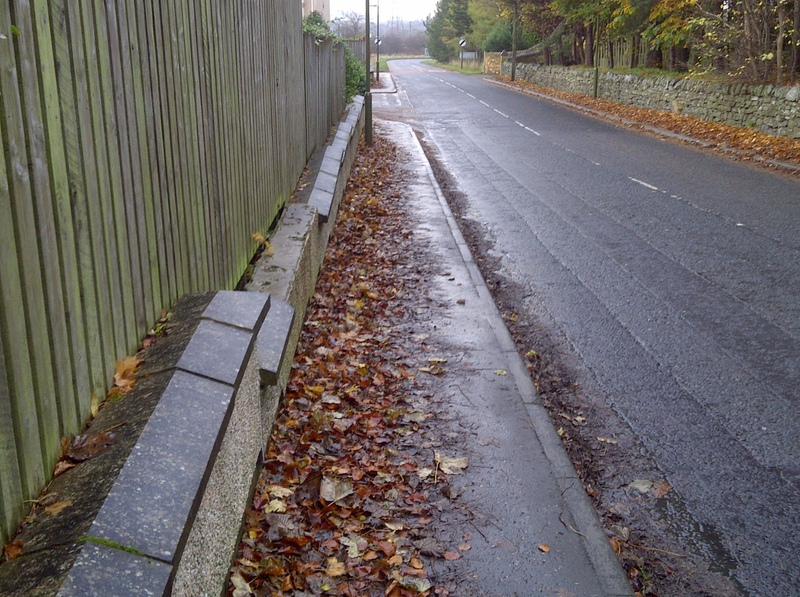 Additionally, as requested the estimated cost of providing traffic calming on Main Street from Hillhouse Wynd to Forth View is likely to be around £40,000. In response to the request for the existing 30mph speed limit east of Hillhouse Wynd to be extended further east. Unfortunately it will not be possible to extend the 30mph speed limit furthereast at this time. This is because speed limits are set based on the character of the road and the level of adjacent development, in accordance with Scottish Government guidance. However, the speed limit will be reviewed, if further development to the east of Hillhouse Wynd is proposed in the future (the triangle of land near the footbridge has been earmarked for sheltered housing if funding becomes available). Pedestrian safety concerns as the result of the existing narrow footway between Hillhouse Wynd and Kaimes Crescent. Unfortunately due to the constructional constraints resulting in thesignificant cost of widening this footway, it is unlikely to happen in the nearfuture. However, a request for the footway widening will be added to our request list, to be assessed should funding become available. The issues detailed in your report regarding cycle facilities and remote paths has been forwarded to the council officer responsible for cycle infrastructure (we have also sent the Transport Initiatives report to Andy to pass on). A survey carried out in September 2005 on the C27 outside Ormiston View near Gogar Burn showed average speeds of 27.4mph eastbound and 29.1mph westbound. A survey carried out in May 2007 on the B7031 Station Road showed average speeds of 31.6mph east and westbound. A survey carried out in December 2008 on MainStreet near Hillhouse Terrace showed average speeds of 27.6mph eastbound and 29.2mph westbound. As you can imagine the volunteers of the group are quite happy to follow due process at the moment but are determined to prevent a serious incident from occurring rather than be prioritised if one happens! 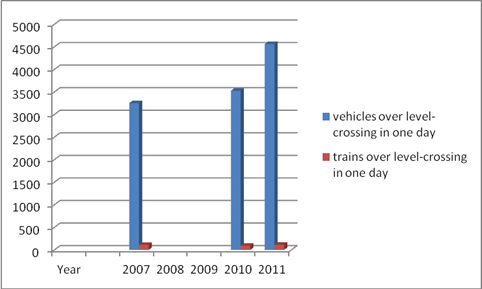 As part of our investigations Network Rail have provided the the figures of cars going over the level crossing in one day in 2011, 2010 and 2007. These figures are calculated by ALCRM so may not be exact but a likely prediction. The vehicle numbers suggest an upward trend, as suggested by members of the local community. It’s thanks to volunteers coming forward that we get things done in Kirknewton – you will hear more stories on this blog all this week. We also want to know what skills and volunteer time you do already or can offer (and we want to hear from you, even if you can’t) via our Skills and Volunteer survey at http://www.surveymonkey.com/s/B8SCJJB (or on paper from various outlets in the village) – it takes less than 5 minutes to fill in and we need your reponses by 22nd November. Thanks in advance for taking the time to fill out the survey.